WOW! 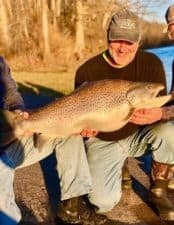 New State Record Brown….out of Taneycomo! Another beautiful day today. Should be in the upper mid 50s today with lots of sunshine. 60S tomorrow, back to the mid 50s Wednesday then rain possibly on Thursday and temps into the 40s. Unfortunately, right now, the weekend looks pretty cool. Still using four units to run the equivalent of two units. Table Rock is only a half a foot above power pool and they are keeping Taneycomo about 5-6 feet above no generation level. Taneycomo holds the new state record brown trout. It was caught by Paul Crews from Neosho, Missouri this past Saturday. This beauty was 38 inches long with a 27 inch girth and weighed 34.6 pounds. Paul caught it on a 1/8 ounce sculpin colored marabou jig. This brown is part of the triploid Brown Trout the Missouri Department of Conservation started stocking in 2013. The original plan was to stock a total of 15,000 fish into Taneycomo over a three-year period of 2013, 2014 and 2015. This picture indicates this was a great addition to our fishery! This entry was posted on Monday, February 25th, 2019 at 10:37 am	and is filed under Fishing Reports. You can follow any responses to this entry through the RSS 2.0 feed. You can leave a response, or trackback from your own site.